We are excited that Dagri Rinpoche will be returning to Land of Medicine Buddha this Summer! 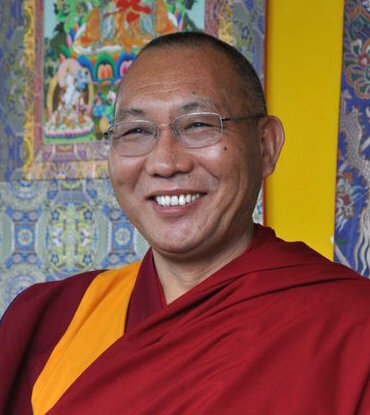 Rinpoche will give teachings from June 21–26. Rinpoche will also be our Guest of Honour, along with Geshe Ngawang Dakpa at our the Annual Medicine Buddha Festival Day on July 1. Dagri Rinpoche will be mainly giving a Chod initiation, followed by teachings on how to do the practice, from June 22–26. On June 21, Rinpoche will give a Dharma talk on the Buddhist path which is open to the general public. All are welcome. Do not miss this precious opportunity to meet such an amazing lama. After many in-person and written requests from LMB, the causes and conditions have come together for Dagri Rinpoche to accept our invitation and travel to California. Rinpoche mentioned that these teachings are the results of LMB’s persistent invitations! to the public and ordained Sangha! The reality is the cost of travel for Rinpoche and Rinpoche’s attendants, food, and offerings run more than $1000 per day to host a teacher such as Rinpoche. You can see, Land of Medicine Buddha simply can not do it without financial support from generous donors like you! We invite you to be a benefactor of Dagri Rinpoche’s precious teachings! It is with great joy that we offer YOU the opportunity to support LMB, Rinpoche, and your fellow dharma practitioners by becoming a benefactor for this event. The wish to be of benefit to others is at the heart of the Buddhist path. The greatest gift we can offer is the gift of the Dharma; it provides benefits not only for this life, also for future lives up until enlightenment. Our own kind lamas understand the practice and merit of sponsoring Dharma teachings. Lama Zopa Rinpoche regularly sponsors teachings of His Holiness the Dalai Lama. Dagri Rinpoche himself also sponsored Dharma teachings that he attended of His Holiness the Dalai Lama and Jangtse Choje Rinpoche in South India. Join us to perfect the giving of the Dharma! Huge merit for sponsoring Dharma teachings for the benefit of other sentient being, not to mention creating the cause to receive more Dharma teachings in the future! Alternately, become a Sangha Sponsor with a donation of $375. This amount will sponsor a Sangha member to attend the teachings, including meals and accommodations. Imagine the benefits for them and the limitless beings that they reach! Select your donation option below to be a major benefactor or contact our Director at: director@medicinebuddha.org. Dagri Rinpoche was born in Tibet in 1958, and grew up during the Cultural Revolution of 1966-1976. Although he was recognized at an early age as the reincarnation of Pari (Dagri) Dorje Chang, one of the very great geshes of Lhasa, the political situation in Tibet prohibited religious training. He, like other Tibetans, experienced great hardship during these years. He attended ordinary governmental school and worked as an animal herder and, later, in a coal mine. Even in such humble conditions, everyone who knew him was moved by his outstanding inner qualities, his warm heart, his power, and his care for others. In 1978, the Communist government relaxed the religious persecution somewhat and Rinpoche went to Lhasa, where he was ordained, began to study Buddhist philosophy, and helped to restore Tibetan monasteries. Many students from his past life—that include Jangtse Choje Rinpoche, Geshe Lhundup Sopa, Lama Thubten Yeshe, and Geshe Lama Konchog—made requests and wrote letters urging Rinpoche to leave Tibet for India. They helped to make travel preparations and obtain travel documents. After his escape from Tibet in 1983, he completed 17 years of Buddhist philosophical studies at Sera Je Monastery and received the Geshe Lharampa degree, the highest qualification obtainable. He was first in his class during subsequent training at the Gyumed Tantric College. Since 2001 Rinpoche has taught the Dharma in Asia, Europe, and North America. He is especially involved with supporting His Holiness the Dalai Lama and the work of Lama Zopa Rinpoche and the FPMT.